Summer is coming up, and to celebrate, Headmaster Ambrose has recommended some crafts to make at home! These fun Wizard crafts for kids were hand-picked by the faculty at Ravenwood School of Magical Arts and are guaranteed to make your summer all the more magical. In order to be an extraordinary Wizard, one must have a personal spellbook to read and use to jot down magical spells. A spellbook is vital to learning the art of spell-casting and Wizardry, and is something every young Wizard should own. This easy craft requires only a few items you have at home. In no time, you’ll have the perfect book to write your enchanting spells in! First things first, gather all of your book-building supplies. Next, select your favorite color of construction paper. Use it to cover the entire surface of the notebook or cut it into whatever design waves your wand. Then, glue the paper down and let your creativity take over. Using markers, glitter, other pieces of decor and glue, add on your own Wizarding flair. This is your spellbook, after all. After your designs have dried, open up your spellbook to begin filling it in with your favorite Wizard101 spells! Next is a craft you can eat: edible wands! All Wizards know their wands are the most powerful tool in their arsenal of magic. After you’re done casting spells on your friends and family, you can use your wand to fill your tummy. In a microwave-safe bowl, melt your preferred flavor of chocolate chips for 30 seconds in the microwave. Take the bowl out, give its contents a stir and put it back in the microwave for 10 seconds more until the chips are fully melted. While your chips are melting, lay out a sheet of wax paper in your cooking area. 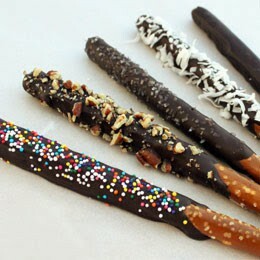 Dip your pretzel rod into the melted chocolate chips. To better cover your pretzel rod, use a butter knife to spread the warm goo. While the chocolate is on the pretzel and still warm, use sprinkles or edible glitter to create your perfect design. Finally, place the newly forged wand on wax paper to dry. Once dried, your wand is complete. Go cast some spells! Ever wanted a hat just like Headmaster Ambrose? You’re in luck! Though it takes many, many years to become a great Headmaster Wizard, this unique hat helps you forge that path. Before you begin your magic, set your compass to 15 centimeters—that’s from the metal tip to the tip of the pencil. Next, draw a semicircle on your construction paper or cardboard using your properly configured compass. You are now a mathematician and a wizard! Cut out your semicircle, making sure to keep the flat edge straight (the part between the beginning and end of the curve of the semicircle). Now that your paper is cut out, roll it into a cone. Keep trying different rolls until the bottom edge of the hat, the brim, is as flat as possible. You don’t want your hat to be crooked! Glue the hat together at the sweet spot you found. Use the stapler to staple the hat in place so you don’t have to hold it while it dries. This is the best part! Unroll a big sheet of aluminum foil and draw whatever shapes you want on it (moons and stars if you want to be like the Headmaster). Then, cut the shapes out and glue them onto your hat. You now have a superb and shiny hat of immense power! And there you have it! Three unique crafts, perfect for a magical summer at home. What other crafted items would you add to your spellbook, wand or hat? What great ideas – especially loving the wands – over here, in the UK, I’m not sure if we have Pretzel sticks but we do have Bread sticks; I’m sure that they would make excellent wands too. What a creative lot you are.